The Days of Johann, an agility dog! : Some Holiday fun! With all this Howliday Giveaway the past couple of weeks Gracie, Wolfie, Wiggy and I are gettin' in the Holiday spirit! We like the Holidays so much that last year we made an entire Squidoo Lens dedicated to Christmas for Dogs. Head on over sometime, it's a lot of fun, we call it 'A howliday destination for pups and pup lovers!' You can watch holiday vids, read poems, have a good chuckle over some comics, get some tips on some great homemade and store bought pup gifts, and more. 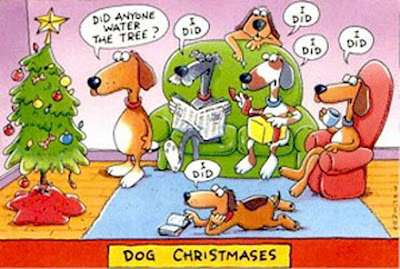 So put your paws back, get a nice cup of hot, and enjoy A Doggie Christmas! Some decorations are going up, and on our walks we see lots of lights around the neighborhood. But no pups get ready for the Holidays like these guys! And of course, one of my favorite videos to get in the spirit of the Holidays! It's Bailey the Unknown Reindeer! Aww, thanks, Johann. you and your mum always do the nicest stuff for us doggie bloggers. And thanks for finding, testing, and researching all those products. it's a real time saver for our humans!